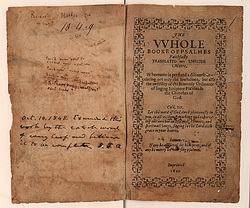 This was the very first book published in the New England colonies. This book included lessons on reading and spelling with a Christian theme. 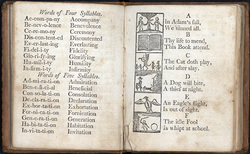 For example, for the letter "A", students were to read, "In Adam's fall, we sinned all," which reinforced the Puritan belief in Original Sin. 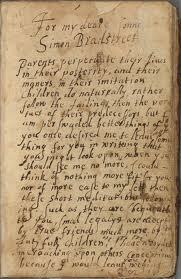 about the Puritans' crossing to the Americas. 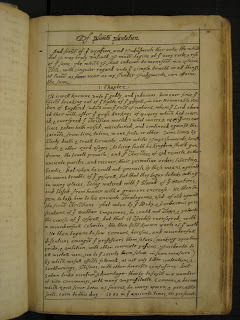 This is an excerpt from the historical narrative by William Bradford. 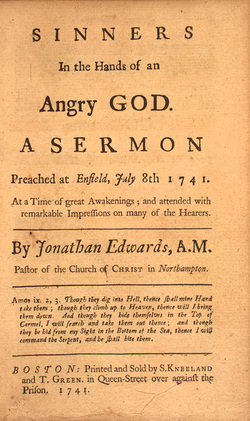 Poetry: "Upon the Burning of Our House" and "To My Dear Beloved Husband"
This sermon, given by Jonathan Edwards during a period of early American Colonial history called the First Great Awakening, caused hundreds to refocus their lives with a new emphasis on pleasing God. Assignment: Read "Sinners in the Hands of an Angry God". You will need to watch the YouTube video "America's Great Awakening" to complete the first part of the questions. You can read a .PDF copy of this play here. 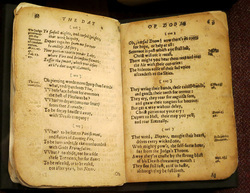 This long, narrative poem about Judgement Day was the first bestseller in the American Colonies.